Last night I travelled to Blue Springs, Missouri, to see 4-star defensive back and Nebraska commit Mario Goodrich’s first game of the season. His team, Lee’s Summit West was on the road to face off against Blue Springs South. The game started later than expected due to a weather delay due to lightning but once the action started it was clear to see why Goodrich has offers from Michigan, Georgia and Oklahoma to name a few. The first thing that jumps out seeing Goodrich in person is just how smooth of an athlete he is. There is not a lot of wasted motion and his burst looks effortless as shown on a 6-yard touchdown run he had early in the game on a jet sweep. Now, because a cornerback is good athlete and teams avoid throwing to their side, you may think that Goodrich is not a willing tackler. You’d be wrong in this case. In talking to Lee’s Summit West Head Coach Vincent Careswell he told me that Goodrich is a very willing tackler, and I did get to see that on display a couple of times during the game. Lee’s Summit West won the game 49-28 and Goodrich was all over the place, but there is another player I must mention, too. Senior running back Phillip Brooks had a monster game. He had over 300 yards of total offense including a pair of 80-yard touchdown catches. Careswell told me after the game that the undersized back (5-9, 165) has an offer from Air Force and is a four-year starter in football and basketball. As for Goodrich, he thought the team came out ready to play and was happy with the season opening win. 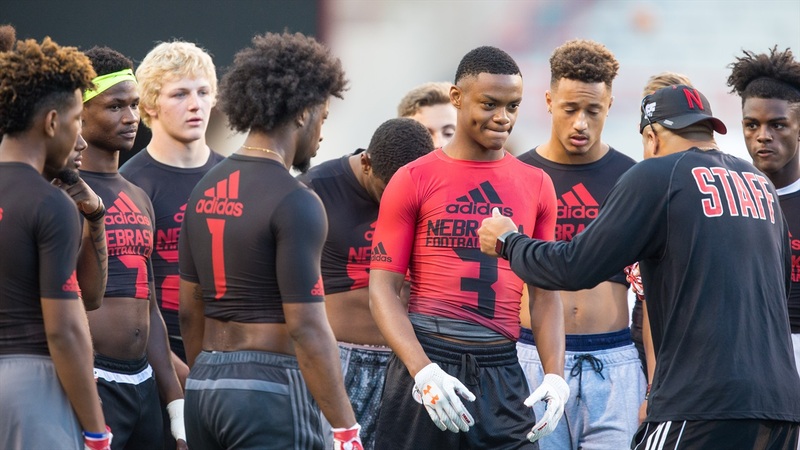 Goodrich confirmed to me that he is being recruited to Nebraska to play cornerback and his lead recruiter is Donte Williams, who he was texting with postgame. I do think his biggest upside is at cornerback and after game one, Goodrich says he felt he played better on defense even though he dropped an interception. Goodrich had four tackles and an interception and an interception in the season opener. The other two times Blue Springs South dared to throw his way, he dropped one interception and broke up another pass.